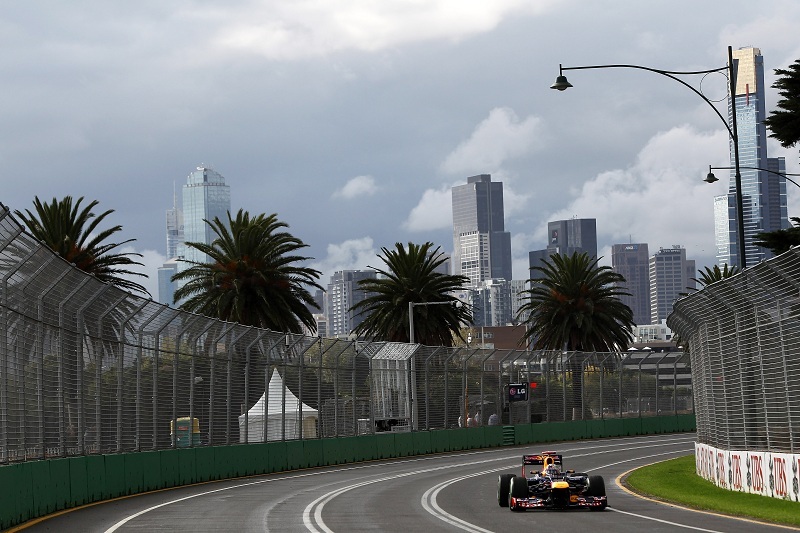 The most exotic open wheel racing series in the world opens their 2012 your this weekend on the 5.303-kilometer (3.295-mile) Albert Park circuit. With various changes during the winter off-season, the race provide the first chance for drivers and teams to apply their testing to a real-world competitive environment. With the race set for Sunday, Saturday qualifying set-up a taste of what the world Formula 1 attendance can expect for the new season. The first time for 24 race machines to clock meaningful, competitive times on a race track, qualifying for the 2012 Australian Grand Prix sets up what could be a very unpredictable Formula 1 championship. At the end of the first qualifying session, the dominant vehicle was the Sauber-Ferrari piloted by Kamui Kobayashi. Clocking in with a time of 1-minute, 26.182-seconds, Kobayashi was followed by the Scuderia Toro Rosso car of rookie and 2010 British Formula Three champion Jean-Eric Vergne. While Kobayashi's Sauber achieved a fastest time among the Formula 1 competitors during the Q1 session in Australia, his teammate Sergio Perez was also quick securing the 4th quickest time in the first session. Well into the top-17 cars, the Sauber team would be unable to back up their success in Q2 as Kobayashi could only muster an 13th place qualifying effort while the car of Perez suffered a gearbox ailment that will drop the driver to 23rd for the start of the Australian Grand Prix. In Q2, some of the typical front-running Formula 1 efforts surged forward in the qualifying session for the Australian Grand Prix. Michael Schumacher and Nico Rosberg mounted some fast times in the Mercedes GP cars. At the end of qualifying, Schumacher would hold onto a 4th place starting spot while Rosberg took 7th. In 2012, the Mercedes GP team continues to search for their first grand prix victory since buying up the Brawn GP operations following the 2009 season. As some of the top teams began to steal the show, the Ferrari of two-time F1 World Champion Fernando Alonso drew eyes in qualifying in a less enviable manner. Going into turn one, Alonso kept the edge of the frontstretch grass and quickly lost control of his Ferrari. Sliding into the gravel trap, an overly optimistic Fernando Alonso waited in his car eager to get towed back onto the race track. However, the Ferrari was just too buried leaving Alonso with a 12th place starting spot. While teammate Felipe Massa was able to circulate throughout the Q2 session, his fastest time was a deep 16th starting position for the Australian Grand Prix. After the first qualifying session, the Ferrari team cars have proven to have temperamental handling that could make for a long 2012 season for Italy's favourite auto racing team. While the Mercedes GP team led Q2, the final Q3 session saw the McLaren-Mercedes cars climbed to the top of the time charts. Through the end of last season, the McLaren-Mercedes cars driven by Lewis Hamilton and Jenson Button were zeroing in on the Red Bull Racing squad in Formula 1 competition. The first round of the 2012 Formula 1 tour held at the Albert Park circuit in Australia would see McLaren continuing on their fight back to the top the grand prix grid. Their new MP4-27 debuted brilliantly as Hamilton posted a 1-minute, 24.922-second lap time. McLaren to Hamilton teammate Jenson Button was little more than 15/100th of the pole time securing an all-McLaren front row. Joining the McLaren cars on the podium after qualifying was the Lotus Renault GP racer Romain Grosjean. A big day for the French driver, Grosjean has spent several years as part of the Renault Formula 1 team as a test driver and even competed in races during the 2009 season replacing the vacated Nelson Piquet Jr. Following the third place qualifying performance, Romain Grosjean commented, “Today is like a dream come true. I only really discovered the Albert Park circuit in the dry this morning and I didn’t know what to expect." Crediting his team and the design of Lotus-Reanult new E20 race car, Grosjean added "I will not get carried away because, as the saying goes, you don’t score any points on a Saturday. We all know that Melbourne can be a very tricky race. I hope we can keep going like this all season long and in the end it will be a nice story." Reigning Formula 1 champion Sebastian Vettel acknowledges the dream season of 2011 is over. “It’s the first qualifying of the year, so it’s always difficult to know what to expect, but I think what we saw today was not a surprise, the lap times were close." said Vettel admitting this year's competition will be much tougher. Throughout qualifying, the Red Bull Racing team's new RB8 vehicle in the hand s of Vettel and Australian Mark Webber would never legitimately challenge for the pole position. Red Bull-Renault race cars are seated 5th and 6th on the grid for the 2012 Australian Grand Prix. One trend occurring on the Formula 1 grid through 2012 is the stepped or "duck bill" nose incorporated on the race car designs. Ferrari, Mercedes GP, Lotus Renault GP and Red Bull Racing are part of the majority that opted to take this design feature as team engineers continue to concoct way around the Formula 1 rules. Contrary to the trends, the McLaren-Mercedes MP4-27 cars that qualified 1-2 for the Australian Grand Prix feature the one traditional front nose piece. A final note after qualifying regards the HRT F1 team. Off season preparations for the team's F112 car hit massive development delays as the vehicle needed to pass mandated FIA crash test requirements. In fact, the first track session with the new HRT F1 car didn't take place until the 5th of March (just 11 days before the Grand Prix of Australia). The HRT cars driven by Pedro de la Rosa and Narain Karthikeyan were hideously slow during the practices at Albert Park. Almost 2 seconds slower in qualifying than the 22rd place Marussia car, both HRT F1 ended the Q1 session outside of the minimum required lap time to start the Australian Grand Prix. Petitioning the race stewards for the chance to participate in the first grand prix of the 2012 Formula 1 season, the HRT F1 racing teams were denied entrance into the race. With 22 cars taking to the grid at Albert Park, the 2012 Australian Grand Prix is set to start at 5 PM local time (2 AM in the Eastern time zone).